Some elements from the south west are merely testing the waters. But they will not go far with that experiment. The Igbo are being harangued. They are being blackmailed; even brow-beaten over the presidency. Their right to the office is being repudiated and questioned. It is being made conditional. Somebody somewhere is trying to give the impression that the right of the Igbo to the office of the president is a privilege, not a right. That is why they are being tossed about like a snail shell over the matter. In 2015, the Igbo shunned Muhammadu Buhari at the polls in preference for the then president, Goodluck Jonathan. Hell was let loose thereafter. The Igbo were pummeled from all quarters. They were accused of voting wrongly. The critics made it look like every segment of Nigeria must vote in certain prescribed ways. They conveniently ignored the fact that prescriptions and proscriptions are not the stuff Nigerian elections are made of. Different segments of the country vote according to their perceived or declared interests. Over the years, the south west and north of Nigeria have been very well known for this. But when the Igbo voted according to their group interest in 2015, their exercise of their franchise was made to look ill-considered. They were told that they made a mistake. Four years after, critics of Igbo voting pattern are up in arms again with their antics. They are telling the Igbo how they must vote if they must have a stake at the presidency. They are asking the Igbo to embrace Buhari in 2019 if they must dream about the presidency in 2023. That is the trending blackmail. It has, in recent weeks, become the sing song of the Secretary to the Government of the Federation (SGF), Boss Mustapha. He has repeatedly told the Igbo to vote for Buhari in 2019 in order to secure a chance at the presidency in 2023. The way the SGF has been sounding, it is like he has the authority to determine the political future of the Igbo race. That is the effrontery and audacity that some people have been wielding. Individuals who accidentally found themselves in government have been toying with the destiny of an entire race. But that blackmail does not seem to be working. The Igbo are not about to embrace a president who has discriminated against them in a manner no Nigerian leader has ever done. Having lost the hope of winning Igbo votes for Buhari in 2019, the schemers have changed their tactic. Their effrontery has graduated to impudence and mischief. That is what is oozing out of the south west at moment. The mischief-makers have got the Yoruba to start laying claim to the presidency in 2023 as a way of putting the Igbo on edge and, possibly, blackmailing them into accepting Buhari at the 2019 polls. The first hint of this plot was dropped by the former governor of Lagos state, Ahmed Bola Tinubu, after a meeting with President Buhari. He disclosed after the closed-door meeting that Buhari has committed to handing over power to the south west. This was followed by the salvo fired by the Minister of Works, Power and Housing, Mr Babatunde Raji Fashola. He told his Yoruba kinsmen sometime in October that they should vote for Buhari in 2019 in order for them to take over the presidency in 2023. Two months after, the kite flown by Fashola has navigated back to base. The Vice President, Prof. Yemi Osinbajo, has picked it up. He has released the flying object into the air with all the attendant ripples and reverberations. Like Fashola, Osinbajo has asked his Yoruba brothers and sisters to vote Buhari in 2019 so that 2023 presidency will be theirs. But the Vice President went a step further. He told his people that Buhari promised to hand over power to the south west after his tenure. A vote for Buhari, he told them, is therefore a guarantee for south west presidency in 2023. This is the new tactic making the rounds in the Nigerian polity. The Igbo are being pushed to the wall with this insidious plot. In one breath, it is aimed at blackmailing them into abandoning their political ship and jumping unto the Buhari bandwagon. In another breath, the plot is targeted at their ego; at making them feel that their right to the presidency, if they have that right at all, is being subjected to the whims and caprices of others. But then, Osinbajo’s declaration is instructive. If Buhari has a commitment to hand over power to the Yoruba as Osinbajo said, then he is asking the Igbo to reject Buhari through and through. If the Buhari presidency does not offer any hope of tomorrow for the Igbo, why will any right-thinking Igbo vote for Buhari? 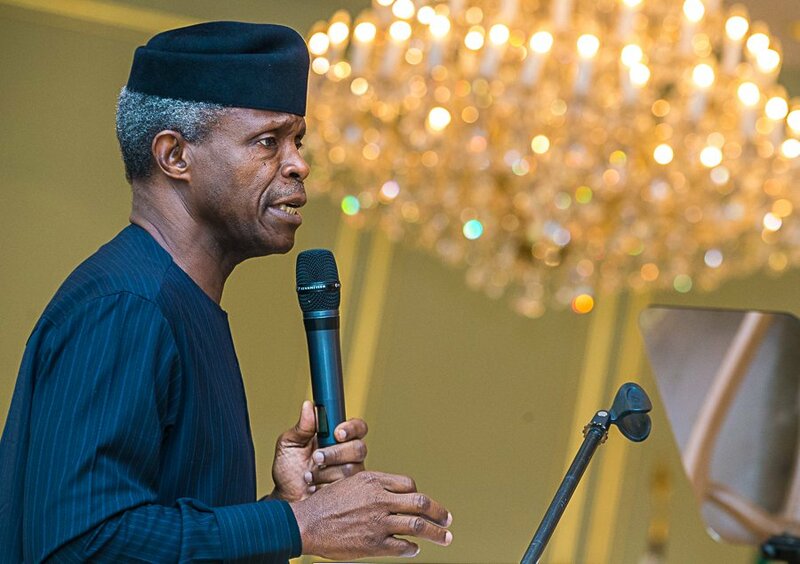 By his declaration, Osinbajo has disqualified Buhari from the race in the south east. Was that what the Vice President set out to achieve? That is very doubtful. Osinbajo’s disclosure is therefore most impolitic. Beyond the plot at boxing the Igbo into a corner, part of the aim is to divert attention from the performance of Buhari in office. is saying that 2019 is going to be a tribal contest between the Igbo and the Yoruba. It is not going to be about whether the ruling party which is hoisting a Hausa/Yoruba ticket deserves a return or not. That is the extent to which some people have trivialized a contest that is supposed to be about the peace, progress and stability of Nigeria. I have had occasion to comment on this issue a couple of times in this column and I have always held that the gimmick from the south west should be taken for what it is – a huge joke with temporary entertainment value. The Igbo will take their turn at the presidency when power returns to the south. Any other southerner, including the Yoruba, can aspire to the office. But it should be taken for granted that Nigerians will be united in settling for an Igbo candidate. Besides, those promoting this hate campaign are trying to give the impression that it is one man called Buhari that will determine the political direction of the country. But we know he does not have that capacity. Nigeria is too big for the fancies and fantasies of any individual or group. Buhari will run his course and leave the stage and Nigeria will move on according to the dictates of the people. When we move away from the fantasies of some Yoruba people over the presidency, we will be faced with some Igbos whose interest in the presidency is only self-serving. Where are those Igbos who are so interested in the presidency to the extent that they had to query the choice of a running mate from the south east by Atiku Abubakar? There was no issue over Atiku’s choice of one of their own for the office of Vice President. Yet they tried to create problem where there was none. If there is any issue about the presidency that should catch their attention, it is this assault on the sobriety of the Igbo from the south west. I expect the do gooders of the south east to pick up the gauntlet. They should speak up now or keep quiet forever over the presidency. Lord, is he the new messiah under the African sun? of this moribund shithole country of ours. Such Igbos are very unwise,because they seem to have forgotten the past. Ofili, for the Office of the Presidency after him, a notorious Igbophobe,Chief Edwin Kaigbodo led a delegation of Igbohaters to the Chief. Chief President Olusegun Obasanjo’s move by warning him that, Dr. Peter Offili is an Igbo. must always remember that the past belongs to us not us to the past. right to remember and honour our fallen Biafran heroes and those million innocent victims of Nigerian Genocide against us Ndigbo. Ebele Azikiwe Jonathan,we Igbos have not been allowed to celebrate Xmas,Easter Holidays and New Yam Festivals in peace , withou the Nigerian Army and the Police launching their gobble – dy- gook Python Dance Military Exercise, blocking all the roads and highways leading from the rest of Nigeria into our South East Zone. who collect illegal tolls,rob them of their possessions and impound their vehicles toos. of cut-off-marks policy by JAMB. besides,there are too many enemies within our ranks. Down with Hausa/Fulani Islmic Hegemony!! All Hail Biafra,the Land of the Rising Sun!! !